California's rich diversity of Native American ethnic-and-language groups took shape during the past 12,000 years as migrating tribes settled first on the lush Pacific coast and then in progressively drier, less-vegetated habitats, says a new University of Utah study. "Trying to explain why linguistic diversity is high in some places and low in others has been a big issue in anthropology," says Brian Codding, an assistant professor of anthropology and principal author of the new study, published online the week of Aug. 19 in the journal Proceedings of the National Academy of Sciences. "For a number of years, people have shown a correlation between ecological diversity and linguistic diversity," he adds. "What we did in this study that was different was to look at it over time – to actually see the process through which different populations came to live side-by-side as neighbors or replaced one population with another. We're showing how the diversity actually developed over time." Codding conducted the research with Terry Jones, a professor of anthropology and chair of social sciences at California Polytechnic State University, San Luis Obispo. In the study, the researchers wanted to determine if the suitability of ancient California habitats correlated with when and where wave after wave of Native American immigrants settled during the past 12,000 years – a geologic epoch known as the Holocene – resulting in prehistoric California's extreme diversity of Indian ethnicities and languages. As a proxy for the suitability of habitat, they focused on images from NASA's Terra satellite showing California's modern environmental productivity – known formally as net primary productivity. While the satellite images show the richness of vegetation as seen from space, they really reflect not only plant life, but also the overall richness of the environment in terms of water, plants and animals. 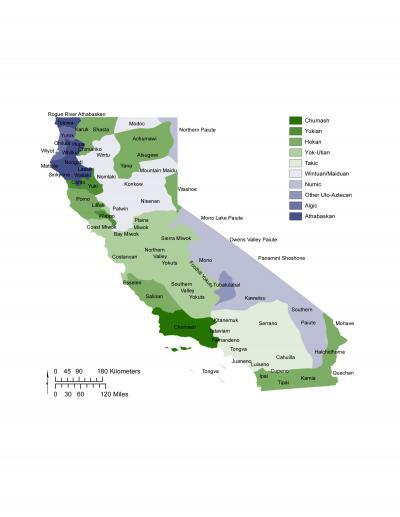 Then they built a map that estimated the distribution of California's Native American groups at the time of the first contacts with Europeans during the 1700s and 1800s. The map and estimates of when various groups arrived were based on decades of linguistic, genetic and archaeological research, although Codding says the map should not be misinterpreted as representing precise tribal boundaries. During the Middle Holocene, about 8,000 to 4,000 years ago, "migrants settled in more marginal habitats," taking up residence farther and farther east in moderately productive inland habitats: California's Central Valley and the Sierra Nevada. These people included the noncoastal Hokan speakers as well as people who left the Great Basin and fragmented and displaced the Hokan speakers: the Yok-Utian, Takic and Wintuan-Maiduan language groups. During the last 1,000 years of the Late Holocene, which began 4,000 years ago, some progressively inland colonization continued, with the Numic language group occupying relatively unproductive deserts of southeast California and the Great Basin, including parts of Nevada and Utah. But the pattern also changed somewhat, with some new migrants – the Algic and Athabaskan language groups – replacing lower-density populations in some coastal habitats. That may have happened because the newcomers used more intensive fishing and hunting methods – nets and weirs, and bows and arrows – and outcompeted earlier residents who used hooks, lines and spears. "The final native people who came to California during the last 1,000 years – for whatever reason seem to have displaced people who had been in some of these highly productive places along the coast, particularly the northwest coast of California, from Mendocino north to Oregon," Codding says. He says there is no evidence of violence during such population replacements, but that the researchers believe the later immigrants, such as Athabaskans, had developed a concept of private property and laid claim to coastal river mouths, where they would camp and intensively fish salmon. "That allowed them to occupy the landscape at higher densities than people who were there before," and then to stay there for millennia, Codding says. This map shows the rich diversity of Native American ethnic and language groups in California at the time of first contacts with Europeans in the 1700s and 1800s. The Native Americans settled California during the past 12,000 years, inhabiting the most environmentally productive coastal environments first and then settling in progressively less productive ecosystems farther inland. The legend on the right shows the major language groups, each of which was spoken by multiple tribes. This map is based on decades of linguistic, genetic and archaeological research and should not be misinterpreted as representing precise tribal boundaries. Credit: Brian Codding, University of Utah. The replacement of earlier coastal populations with later ones resulted in "fragmentation of earlier groups and the development of one of the most diverse ethnolinguistic patterns in the Americas," Codding and Jones write. "Such a process may account of the distribution of ethnolinguistic diversity worldwide." Codding says: "We can use these general results to try to understand how ethnic diversity builds over time in different areas. … If you look across the world, some places have a lot of different language families within a small area – New Guinea, for example – and others like the Great Basin just have one [Numic, used by Utes, Piutes and Shoshone peoples]. It suggests that where we see a lot of ecological diversity, migration patterns probably should result in the buildup of linguistic diversity. "In a place like California, you have a great amount of ecological diversity that allowed some places to have a higher density of people and others to have a lower density of people," he adds. The researchers conclude the study by saying their approach "may aid in the explanation of prehistoric hunter-gatherer migrations across the globe, including the initial spread of people out of Africa into Europe, Asia and across to Australia-New Guinea." The general pattern that migrating groups occupy successively less productive habitats – resulting in high language diversity in lush environments and low diversity in desert environments – can be complicated by other factors, including marriage between groups, network of trade and warfare, Codding says. He and Jones write that in areas other than North America and Australia-New Guinea, the more recent migrations of agricultural peoples erased the linguistic histories of earlier hunter-gatherers. But Codding and Jones say that using archaeological methods as well as the environmental productivity approach eventually may "help to elucidate why and how humans spread across the planet, creating a patchwork of linguistic and ethnic diversity."